This popular old-fashioned Cajun cake is an easy one-layer pineapple cake finished with a coconut and pecan topping. It's a moist and delicious dessert, perfect for a potluck, book club meeting, or morning coffee gathering. The flavors might be tropical, but it's a Louisiana cake through and through! 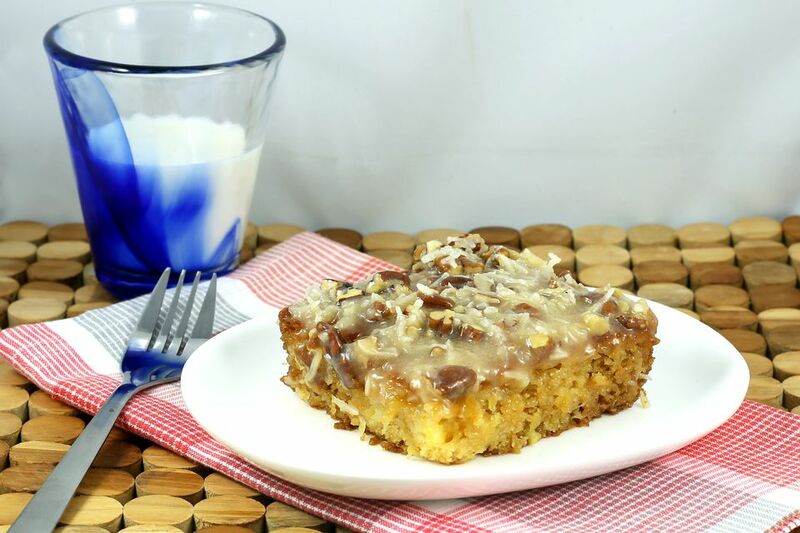 Feel free to use walnuts for the topping of the cake instead of pecans. Grease and flour a 9-by-13-by-2-inch baking pan. In a mixing bowl with an electric mixer, beat the eggs with the pineapple until well blended. In another bowl, combine the flour, sugar, salt, and baking soda. Whisk or stir the dry ingredients to blend thoroughly. Stir the dry ingredients into the first mixture; blend well. Spread the batter in the prepared pan and bake in the preheated oven for about 30 minutes, or until a wooden toothpick inserted in the center comes out clean. Make topping (below) while the cake is baking. In a saucepan over medium heat, combine the butter, granulated sugar, and evaporated milk; bring to a boil. Reduce the heat to low and boil gently for 10 minutes. Remove the saucepan from the heat and stir in the vanilla, coconut, and pecans. Spread the topping mixture over the hot cake.